Think BIG - A Brain Building Program: What is a Neurodevelopment Disorder? Home > Chiropractic Care: Apex Chiropractic & Wellness Center: Cincinnati Ohio > Children and Learning: Improving Through Chiropractic Care > Think BIG – A Brain Building Program: What is a Neurodevelopment Disorder? Think BIG – A Brain Building Program: What is a Neurodevelopment Disorder? Neurodevelopment disorders affect how the brain develops and how it processes information. Through its negative impact on learning, focus, behavior, social skills, sleep, and self-esteem, a neurodevelopment disorder can reduce your child’s ability to reach his or her full potential. Addressing challenges early on can help your child achieve more throughout life. Parents are often frustrated and overwhelmed by the day-to-day realities of caring for a child with one or more of these disorders. How can you help your child when you don’t know where else to turn? 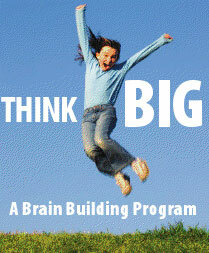 Think Big is an individualized program to help your child reach his or her maximum potential through safe, drug-free treatment. Our holistic brain-building approach supports proper neurologic development and function. In Think Big, we customize treatment plans to fit the needs of each individual. There are three main components to each plan. Chiropractic Care. Designed to balance and enhance the nerve system, including the vestibular and proprioceptive systems. Maximizes the body’s natural capacity for self-healing. Neurosensory integration. Training the visual, auditory, tactile, vestibular and proprioceptive systems to work together for optimal function. May include at-home exercises. Nutrition and Functional Medicine. Promoting proper development and function for the brain and body through delivery of essential nutrients and guidelines for daily living. Click here to learn more about nutrition and functional medicine. This comprehensive program results in improved behavior, better grades and increased coordination. Your first visit will include a detailed review of the history, a postural exam, a chiropractic exam, and a neurosensory evaluation. This generally takes 45-60 minutes but sometimes we need to break up the appointment to accommodate the child’s abilities and complete it over two appointments. You will then be scheduled for a follow-up appointment to review the results of the exam and discuss treatment options.